← Tynemouth extension takes shape. 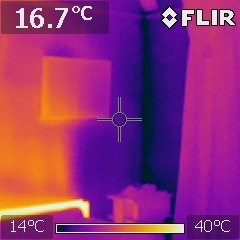 We have been fortunate enough to have had a loan of a Thermal Imaging Camera in order to study the heat loss and cold spots in a domestic property. The images make very interesting reading especially as it was 5c outside. The outside of the house shows the typical hot spots you would expect around the windows and doors. The temperature of brickwork appears to be around 0c where as the glass is nearer 3c. The story inside is more interesting and complex. The image opposite shows a cold section of the living room wall. This part of the wall has the unheated lobby next to it and no insulation between the two areas. To add insult to injury, the powerful radiator is sitting right next to it. 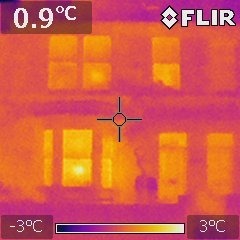 The picture opposite shows exactly how much heat is lost through the decorative timber panels under the windows in a Victorian bay. This is an area which could be easily insulated by taking the panels off and placing high performance insulation between the panels and the outer stone work. Attention has to be paid to any ventilation which may existing in these voids. 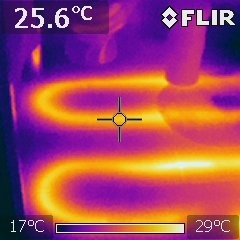 Finally if you were ever wondering where your bathroom underfloor heating pipes were located, take a thermal camera and take a look!